A funny thing happened on the way to a low-risk environment: loans in default (non-performing loans) didn't suddenly become performing loans. If we had to summarize what's happened in eight years of "recovery," we could start with this: everyone's been pushed into risky assets while being told risk has been transformed from something to avoid (by buying risk-off assets) to something you chase to score essentially guaranteed gains (by buying risk-on assets). The successful strategy for eight years has been buy the dips because risk-on assets always recover and hit new highs: housing, stocks, bonds, bat guano futures--you name it. Those who bought the dip in hot housing markets have seen spectacular gains since 2011. Those who bought every dip in the stock market have been richly rewarded, and those buying bonds expecting declining yields have until recently logged reliable gains. The only asset class that's lower than it was in 2011 is the classic risk-off asset: precious metals. Investors who avoided risk-on assets--stocks, bonds, REITs (real estate investment trusts) and housing in hot markets--have been clubbed, while those who piled on the leverage to buy every dip have been richly rewarded. Those who bet volatility--once a fairly reliable reflection of risk--would finally rise have been wiped out. By historical measures, risk has fallen to levels not seen since... well, just before the last Global Financial Meltdown. 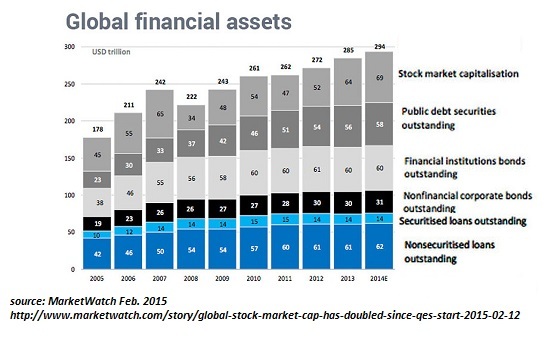 Globally, financially assets have soared from a 2008 low around $222 trillion to over $300 trillion. Even in today's financially jaded world, $80 trillion is an impressive number: over 4 times America's GDP of $18 trillion annually, and roughly equal to global GDP. 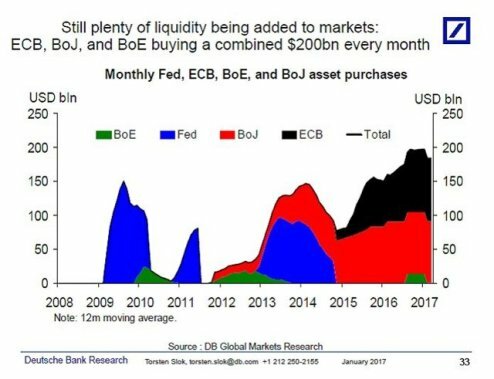 This benign confidence that risk has been sidelined is the result of central bank policy: by flooding the financial markets with liquidity and credit, and by buying trillions of dollars of bonds and other risk-on assets, central banks have sent a simple message: we will never let risk-on assets decline for long, so buy the dips. There are a few flies in the ointment of this wonderful risk-on era. Interest rates are starting to click higher here and there, potentially signaling the end of a 30-year bond Bull market. 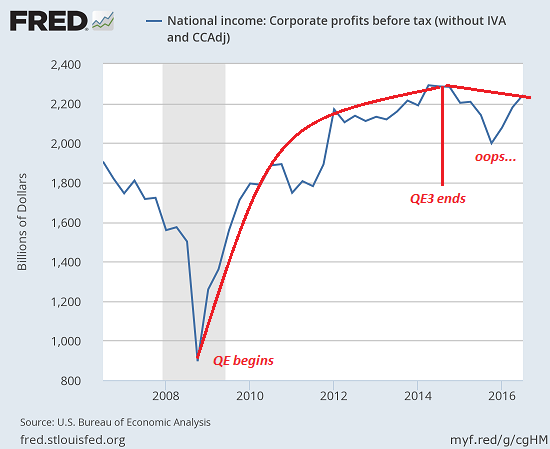 Corporate profits have slumped or stagnated, removing the bullish prop of higher earnings. Full-time jobs, the backbone of household income and income security, have finally edged above their 2008 level--but the gains are exceedingly modest, and far below historic trends. What's actually happened over the past eight years is this: risk has not been vanquished-- it's just been shoved out of sight. To unwary observers, the absence of risk supports the rosy view that risk has been eliminated by central bank policies. But what if risk has not been disappeared, and is piling up out of sight? A funny thing happened on the way to a low-risk environment: loans in default (non-performing loans) didn't suddenly become performing loans. Over-leveraged players didn't suddenly become deleveraged. Nearly empty shopping malls did not become more valuable as their revenues and profits plummeted. All these real-world financial factors are like dead wood piling up on the forest floor. A random lightning strike will ignite this dead wood at some point, and central banks may find they have nothing in hand to extinguish the conflagration but a leaking canister of gasoline. Now that everyone's been pushed into risk-on assets, it might be a good time to look at the dead wood that's been piling higher for eight long years.